For better or worse, Doritos and I go way back. While my favorite will always be Cool(er) Ranch, I love trying any and all new Doritos flavors I find in the US and Canada. Every now and then, I like to try Japanese flavors, though they do require a bit more work to acquire. Please correct me if I'm wrong, but it seems like explosion of Japanese Doritos flavors has only happened within the last 10 years. When I visited in 2004, the students I met in Japan hadn't really heard of Doritos and we had to get them from a pricey import store, but now they seem downright common! 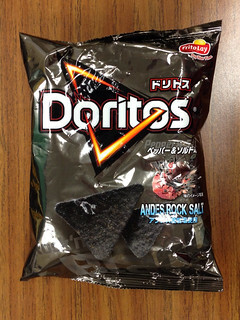 These Andes Rock Salt Doritos called out to me while browsing napaJapan (my favorite site for ordering Japanese treats - and no one gives me anything or pays me to say this). 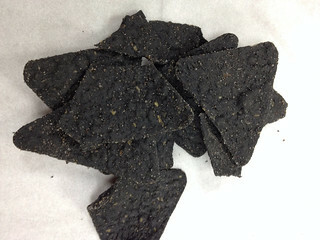 Sure, it's gimmicky, but come one, they're black chips! Sure, it's no Corn Cream Stew, but for some reason, I thought they'd be special. It turns out, they were just peppery corn chips. These threw me for a loop because they don't have that Doritos smell or taste - even different flavors of Doritos still taste like Doritos. Maybe I need to investigate additional Japanese flavors to see if this is only true of North American Doritos. At first, I was very disappointed because these just tasted like regular corn chips. Then, a nice, cracked black pepper flavor kicked in as I chewed, building until the salty finish. After eating a few chips, the heat built to about a medium. The slight spiciness was nice, but I really didn't need to go all the way to Japan to have this experience. At least the bag looked cool.